Heirlooms Reunited: Calling card of Ammy L. Preble, presumably the Ammy born at Levant, Maine, in 1864. 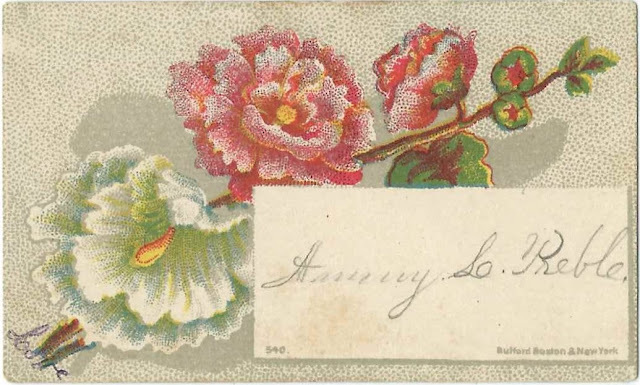 Calling card of Ammy L. Preble, presumably the Ammy born at Levant, Maine, in 1864. 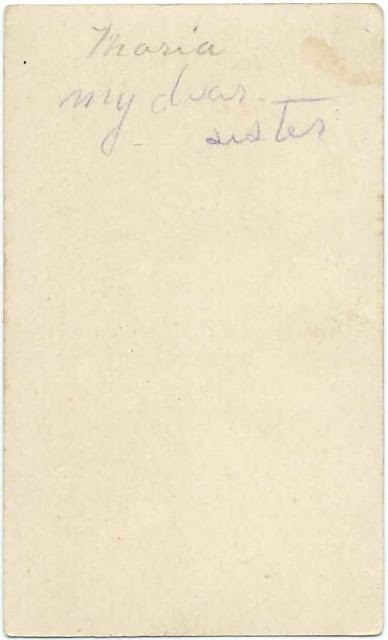 Calling card of Ammy L. Preble, presumably Ammy Elizabeth Preble, perhaps "Lizzie", of Levant, Maine. 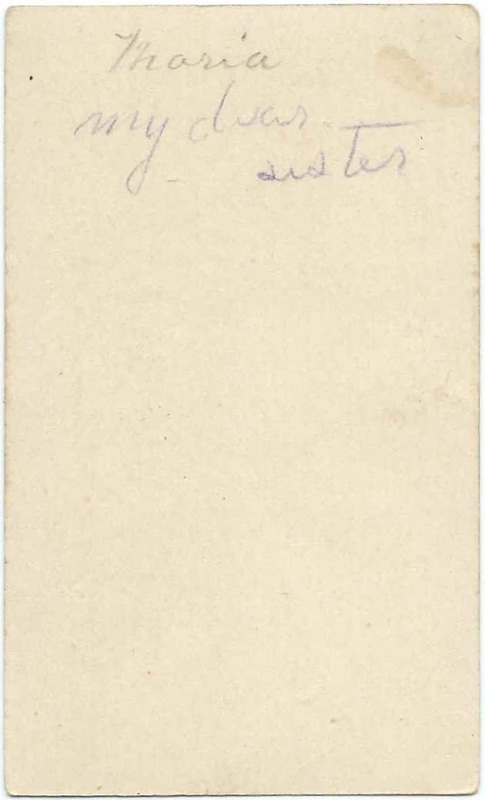 The reverse of the card mentions that it was meant to be given to her "dear sister" Maria. Ammy Elizabeth Preble was born July 20, 1864 at Levant, Maine, daughter of Rufus A. Preble and Ann E. (Bean) Preble. I'm assuming that she went by Ammy Lizzie, to explain the Ammy L. on the card. See another post that features the calling card of Preston H. Waugh of Levant, Maine; he married Mary M. Preble, Ammy's sister. On December 11, 1883, Ammy Elizabeth Preble married Charles H. Hodgdon, son of George S. Hodgdon and Olive V. (Eddy) Hodgdon, who were born in New Hampshire and at Corinth, Maine, respectively. Some records give the family surname as Hodsdon. Charles was born November 12, 1846 at Hermon, Maine, according to information provided on his death record. Charles may have been the Charles H. Hodgdon who was married to Eunice G. Clark and had a daughter with her. Eunice, daughter of Herman and Matilda S. (Goodwin) Clark, died in 1878 and is buried in the Boutelle Cemetery at Corinth, Maine. Ammy and Charles had, I think, three children. They farmed at Levant, Maine, and East Livermore, Maine. At some point around 1912, Ammy and Charles moved to West Gardiner, Maine, where they died within months of each other in 1918. Ammy's death record indicates she was buried at West Gardiner, Maine; Charles' record notes he was buried at East Livermore, Maine.